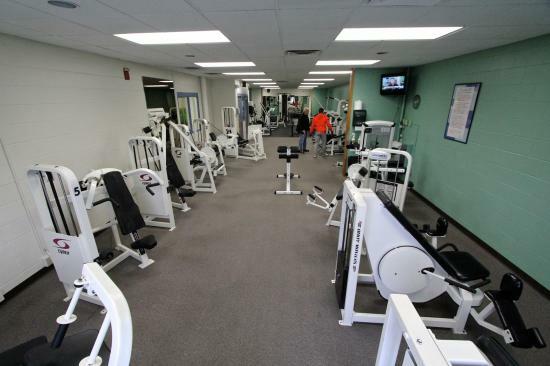 This room is dedicated to strength training equipment and free weights. Equipment includes a Pec Deck, Lateral Raise Machine, Olympic Incline Bench, Power Rack and Plate Loaded Leg Press. We have 12 Cybex circuit training machines available. Additional free weights are available in the room. 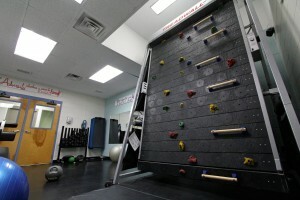 The Kaufman Training Center is dedicated to a true stretching, stability and core room. The room has stretching mats, stability balls, light free weights, stretch cords, medicine balls and balance boards. We also have a 10′ Treadwall in the room. 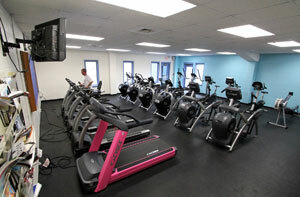 The Cardio Center houses all of our cardiovascular equipment. This room is home base for our Group Cycling and TRX classes.